Nikolai Dolgopolov, deputy editor-in-chief of Rossiyskaya Gazeta, is one of Russia’s most experienced sports journalists. 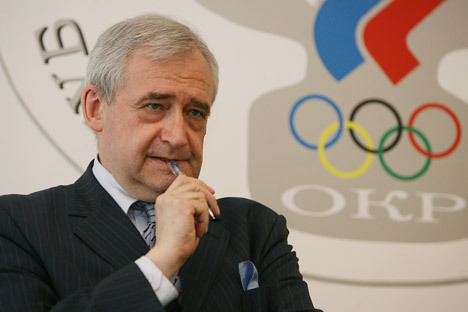 He has covered dozens of competitions since the Montreal Olympics in 1976. Having traveled the whole world over with the athletes, the journalist is waiting for the Olympic Games in Sochi with a special feeling. Rossiyskaya Gazeta: What feelings are you experiencing while you wait for the Games in Sochi? Nikolai Dolgopolov: Feelings of joy. In 2004, there was a group of people formed who believed firmly: “The Olympic Games in Sochi are possible.” Dmitry Chernyshenko is the group’s inspirer—the current head of the Sochi-2014 Organizing Committee. If I was 99 percent sure of it, he was 120 percent sure. So, here is 2007: distant Guatemala, the last round of [Olympic host country] elections, gossip, excitement. I happened to have the exact same suit as the official Russian delegation, so I was allowed in everywhere. I met an old acquaintance, [who was] one of the leaders of the IOC. He asked me why I was so sad. I explained to him that it wasn’t clear who won in the final—us or the Koreans. So my foreign friend said: “You won, by two or three votes, or three. Just do not tell anyone.” There was stir, excitement, but I was absolutely calm. RG: And how did your "Olympic career" begin? After all, during your first games, you were quite young. N.D.: I was young, considering those times. I got into Montreal by chance. As a student, I was a translator in the Sports Committee of the Soviet Union, where I worked with foreign teams and went abroad with the Soviet ones. I was offered to go to Canada as a translator for water sports. Even as a journalist, I wrote about them a lot. Then it happened: I got in, even without a visa in the passport, as a member of the delegation, accredited by the delegation. I did not have the journalist’s accreditation. So I went directly to the Organizing Committee. They were terribly surprised: “What are you doing? How can you?” But, in the end, I persuaded them. I got a real accreditation as a journalist. I think that my knowledge of French helped: They cannot stand English in Montreal. So I had two identities: When I went to handball or athletics, I showed them my journalist’s accreditation, and, in the pool, I was sitting literally on the ledge as a translator. I saw the Olympics from the inside. RG: Since then, you have been to Olympic venues 11 times. Can you recall your most vivid impressions? N.D.: For some reason, I remember the bitterest experience: Salt Lake City 2002. I was so sure that our women's ski relay would win the race, I even partially pre-wrote the winning reportage. I'm standing on the hill of Soldier Valley, waiting. Then a friend of mine, a German, holds out the binoculars: “Nikolai, the Russians are not there.” The very possibility that they may be disqualified on suspicion of doping was incredible. As for positive experiences, mine are a little peculiar. In Nagano, in 1998, I asked figure skating coach Tamara Moskvina , who trained couples: “Which of your couples is going to win?” She gave me a hint that Kazakova and Dmitriev were going to win, and, in the next Olympics, it would be Berezhnaia-Siharulidze. Such a high level! I was impressed: It was not about whether we win or lose, but about who and when. I am proud of our favorite skaters. If my favorite athlete, Evgeni Plushenko, is well, he will yet show himself in Sochi during his fourth Olympic Games. RG: Do you have favorite Olympics? N.D.: It’s the Moscow ones, of course. It so happened that the Olympic Games Organizing Committee branch was opened directly opposite the house where I lived and still live, and I was assigned to it by the newspaper immediately. I was just beginning then. It was a six-year long task— and forget timidity, I knew everything about these Games. I could work as a journalist and a guide. What does the home Olympics mean? It means being the boss, I can’t describe this feeling. RG: One of the dearest Olympics for you was certainly the one in Beijing. After all, you participatedin the Olympic torch relay. N.D.: It was suggested to me before, but somehow it did not happen. In China, it happened. However, it became necessary to fly from Beijing to the other end of the country, changing planes twice—the highlands, where Laos, Vietnam and China converge. We lived high up in the camp of the torchbearers. There I was the only Russian. In general, it was an interesting group of people: scientists, Americans, the president of the Taekwondo Federation, the head of one of the largest South Korean corporations, and, for some reason, simple Filipina girls. Different people, but we quickly became friends; it just happened. We were taught how to handle a torch: You had to keep it a little at a distance with a half-bent arm and the emblem forward. When you pass the baton, you have to put the torches one next to another and count to five. On the count of five, a flame appears. RG: What were we thinking when you were carrying the torch? N.D.: My step was to mount the Snow Dragon. I did not even feel like I ran my segment. I just heard the crowd cheering me along the road, screaming: "Professor, Professor!" It was not even joy, it was a wild euphoria; it seemed to everyone like we were on top of the world, not just to me. RG: And are you still on top of the world? N.D.: With God’s help, I will run the Sochi Olympic torch relay somewhere in the Krasnoyarsk region.